When we currently look at our news messages we read nearly every single day about terrorism, about some young men wearing guns or knifes, building bombs or only using trucks and cars to kill as much people as possible. Is this really terrorism? Terrorism as I know it from former times was defined as political or religious motivated groups of people, fighting for their goals with all means to produce much fear as possible. It is a form of asymmetric warfare, sometimes called „guerrilla warfare“, where non-regular paramilitary is trying to get maximum attention by minimum effort. I know that journalists will not like the next sentence and it is of course introducing philosophical questions about democracy, about free access to information, etc. but it is also the truth and any serious journalist is aware of it: Media and terrorism build together a symbiotic system. Terrorism cannot exist without media. Was haben wir getan, als wir die ersten Programmrechner erschufen.. Wir bauten sie, um die Thermalisierung im Hohlraum der ersten Stufe zur Zuendung der Kernfusion zu berechnen. Und wie sich nach kurzer Zeit herausstellte, war es nicht diese furchtbare Waffe, die wir mit den Programmrechnern erschaffen wollten, die uns den Tod millionenfach brachte, sondern das Instrument zu ihrer Berechnung: der Programmrechner selbst. Die komplexeste Maschine, die je von Menschenhand erschaffen wurde, deren Komplexitaet uns schon in dem Moment, in dem wir sie erschufen, entglitt. 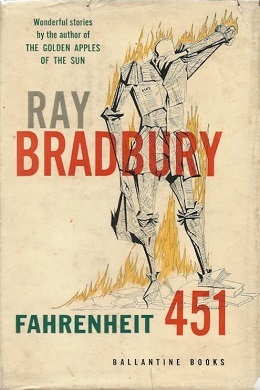 Yesterday I started reading Fahrenheit 451 by Ray Bradbury again. I read it for the first time about 25 years ago, around 1988. The book was published first in 1954 in Great Britain by Rupert Hart-Davis, Ltd. Ray Bradbury is an American Citizen but he found an English publisher for the book. I don’t know if this has something to do with the political circumstances of the USA of the 1950th, but some philosophic writers got problems in this political period and the novel is very sociocritical. It’s an utopian novel, virtually a dystopian story, that tries to show us, that if we loose our books, we loose everything. Why? Because if we loose our books, we loose our history and so the essences of the complete lives of all our predecessors. I was thinking if there are today technologies that are able to completely annihilate mankind and human history, more than the firemen in Bradbury’s novel and their programmable assassin robots can do.